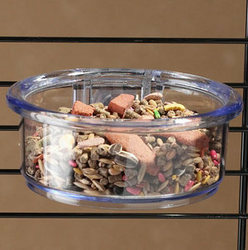 Heavy-duty plastic bird food or water cups attach securely to any bird cage. Ingenious design won't twist, turn, or tip and helps reduce spills, food scatter, and water splashes. Simply attach and tighten the bolt-lock attachment. A great choice for the bird who likes to tip her dish over. Also great for use in travel cages. Dishwasher safe design. Transparent clear design allows you to easily view food/water levels and match any cage d�cor. Simply slide dish on unique quick-lock attachment plate and it's secure - no unscrewing for filling or cleaning. Available in a variety of shapes to best suit your cage space. Dishwasher safe transparent plastic is virtually indestructible and allows an easy view of food and water levels. Can also be used as a birdbath for your bathing beauty. Just fill with water. The Smart Diner is a clear acrylic divided double feeder bird dish that fits both horizontal or vertical cage bars. Smart Diner's actual inside dish size measures approximately 6 inches wide and 2-1/2 inches from front to back. Measurements do not include rolled front perching area which is approximately only 1-1/2 inches high to allow bird to perch and eat from dish. Tallest sides and back of dish measures approximately 3-1/2 inches high to help food remain in dish while the bird eats. Tray slides on and off of its base easily to make filling and cleaning a breeze. Built-in perch allows your bird easy access to millet while wire lock prevents your bird from removing entire millet spray at once. Constructed of super tough, dishwasher safe plastic. Millet tray pairs well with optional Splatter Shield. .
Bird bath made of durable plastic - 5" Diameter. Heavy-duty plastic bird food or water cups attach securely to any bird cage. Ingenious design won't twist, turn, or tip and helps reduce spills, food scatter, and water splashes. Simply attach and tighten the bolt-lock attachment.